I’m not gonna lie, I was as anti-Kindle as they come… until I got one. Now I’m one of those people I used to hate who doesn’t like to read real books anymore because my Kindle is that awesome. Come to the dark side… You can still go walk around Barnes and Noble to get ideas! I don’t know, but I know the company is in better shape… partially because of the Nook, but also because they sell self-published books, which are a huge part of the book market these days… Borders had nothing to do with any self-published books and that was one of the things that really hurt them. Well John, you just KNOW how much I agree with you. It’s a shame. It’s like news websites: great and very up to date. But I would never give up the subscription to my morning news paper. It’s one of the few pleasures of getting up early in the morning: Coffee and a newspaper! 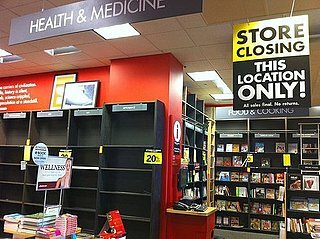 Things change, and unless Big Publishing and these SuperBookstores are going to change along with the new trend in publishing, they will become obsolete. I never liked Borders. Never, ever. Now Barnes & Noble I absolutely love! But ask me the last time I bought a book anywhere but Amazon and I’d have to think really, really hard. Every cries about the demise of bookstores (and typewriters), but then ask them where they bought their last book. That’s what’s telling. They can’t survive without consumers, and if they consumers are buying elsewhere (i.e. Amazon.com) because it’s cheaper AND more convenient, they either need to step up or step out of the way. At least B&N is trying to play catch up with Amazon.com, first with the Nook and now with their PubIt! system, both secondary to Amazon’s product/service. Still, Borders didn’t even try. You’re right about Borders. It’s a shame when you consider the number of Indie and Used Bookstores they put out of bus. I never really liked them, but often (ie: Boston stores) had larger inventory. I’ve never been one to spend time in a bookstore cafe or anything, but for me nothing beats the feeling of roaming the aisles and, perhaps, happening upon an author I was unfamiliar with. You don’t get that with Amazon.com and even if they create some kind of virtual store online, it won’t be the same. Plus, I loved seeing authors give readings and do signings. That’s going away now. To me it just feels more isolating and, as I learned earlier today, the more the isolation the shorter the lifespan. We are social beings. Where will we congregate in the future?